Documenta 14 at the National Museum of Contemporary Art in Athens. Photo: Aristidis Vafeiadakis/PA Images. 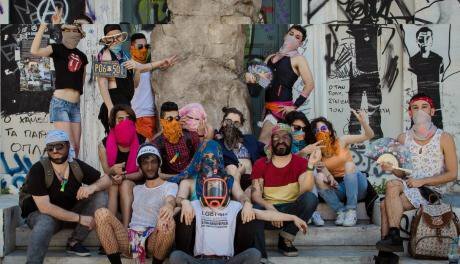 All rights reserved.On a sunny afternoon in May, a group of Syrian and Iraqi refugees assembled in the grounds of Athens Polytechnic University, dressed in drag. They shook their booties and then stole a piece of art from one of the world’s premiere festivals – a two-metre large replica of the so-called ‘Oath Stone’ at which the trial of Socrates took place more than two millennia ago. 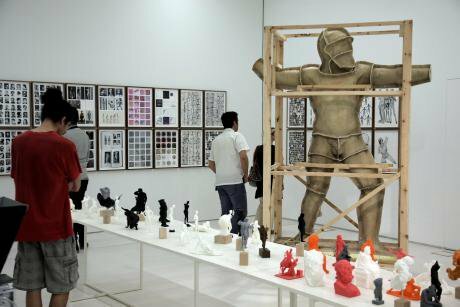 The replica had been commissioned for the equally epic European arts exhibition Documenta 14 (D14), which is in Athens until 16 July. Under the direction of Spanish artist Roger Bernat, the stone toured the city over the preceding fortnight, being ‘blessed’ by various groups. It was then supposed to be flown to Documenta headquarters in Kassel, Germany, and buried. Among the groups invited to ‘interact’ with the sculpture was an Athens-based support group for LGBTQI+ refugees. They were asked to stage a mock funeral ceremony involving the replica, receive €500 for their participation, and then return artwork so that it could continue on its voyage – supposed to signify the ease with which objects, unlike people, can cross European borders. Yet the stone’s travels were short lived. Members of the LGBTQI+ refugee support group absconded with it, releasing a sassy online video message instead. Under the counter-title ‘#rockumenta’, it disparaged the ‘fetishisation’ of refugees and the lavish expenditure on the festival while thousands of migrants languished invisibly across Greece and the continent. Within 24 hours, it had received over 25,000 views. Bernat responded with a hurried press release, claiming that the group had not technically “stolen” the work and stating that they were “no heroes”. He said they should “check their political agenda or their artistic parameters” and “as an artist and as a refugee, you are doomed to be a victim if victimism is your only political weapon”. A week later, views of the stunt had crept to 50,000. It received international media coverage and sent a ripple of controversy through the D14 and activist communities. Bernat returned to Germany where he proudly proclaimed that he had two more replica stones ready to be buried in Kassel. The support group returned as well, to their core work advocating for basic material, social and political rights of LGBTQI+ refugees. “I refuse to exoticise myself to increase your cultural capital”. The unusual episode encapsulated ongoing and acrimonious debates that began with the decision to stage the exhibition in crisis-wrought Greece in the first place, under the banner “Learning from Athens”. Founded after the Second World War, Documenta's original purpose was to bring modern art to a German public who had been deprived such culture under the Third Reich. It has since evolved into a world-class multi-million euro extravaganza. 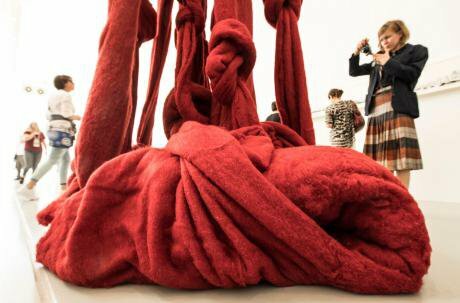 (Documenta said it prefers to describe itself as an 'quincennial exhibition'). This year, for the first time, it’s being held in a ‘guest’ city – Athens, as well as in Kassel. Greece has the highest unemployment rate in the European Union, some of the continent’s poorest regions and it is struggling to accommodate more than 50,000 refugees. Staging the €37 million Documenta festival here has prompted questions about the relevance of art amid social, economic and humanitarian crises. What can something like this offer struggling communities? Documenta 14 exhibition in Kassel. Photo: Boris Roessler/PA Images. All rights reserved.As the festival opened in April, Athens' streets flooded with an under-sunned, over-styled tide of aesthetes from Northern Europe and beyond. Meanwhile, graffiti slogans began to appear around the city: “crapumenta14” and “I refuse to exoticise myself to increase your cultural capital”. Counter events and critique, including from Greece’s former finance minister Yianis Varoufakis, accused the festival of economic exploitation, crisis tourism, cultural essentialism and neo-colonialism. There were complaints that Greece’s meagre arts funding had been diverted from local grassroots artists, curators and cultural producers – who said they were simultaneously excluded from the festival as well. Others have condemned it for failing to engage in the social realities it claimed to want to “mirror” and “witness”. A widely-circulated open letter by local activists supporting refugee squats in Athens challenged the festival’s curators and artists: “By staying silent [you assist] in the eradication of spaces for the thousands of bodies who inhabit this city in autonomous units. In these buildings, artists and activists coexist together with thousands of refugees, who have come here from war-torn countries to seek new lives with dignity and freedom. The silence of Documenta is not acceptable and only goes further to accommodate… the State, the Church and NGOs who stand against us and force thousands into segregated concentration camps, ready for the very bodies your director says he’s trying to protect”. Installation entitled "The disasters of war" at documenta 14 in Athens. Photo: PA Images. All rights reserved.On the surface, the Documenta 14 programme did not shy away from issues of conflict, exile and marginalisation. One of its most celebrated artworks was a marble-sculpted refugee tent nestled alongside antiquities on a slope overlooking the Acropolis. Other works by artists from the Middle East, Africa and elsewhere explored themes of exile, war, migration and poverty, as did a series of open seminars in the festival’s public programme. But, however earnest the content or intention of these costly works, the reality is that most of those who have suffered as a result of Greece’s current economic upheaval – not to mention conflict and displacement – will never see or hear them, let alone influence them. The festival's seemingly unguarded elitism angered members of the LGBTQI+ refugee support group. “[Bernat] talked down to us from the beginning,” Lawrence Alatash, a 23 year-old gay Syrian who has been in Greece for over a year, told me shortly after the Athens stunt. “He thought we were not smart enough to understand what his project was about or not artistic enough to do something like this. We showed him that he should think twice before talking like that to anyone. But his response was totally racist – if he was a real artist, he would think what we did was amazing: dancing, singing, humour. This is art”. LGBTQI+ refugee support group with the 'Oath Stone'. Photo: LGBTQI+ Refugees in GreeceAlatash said D14 was “art at our expense – art which has nothing to do with refugees”. He said: “They do not really care about our situation...If they really wanted to help, they could do something to actually involve us – not simply to make money. Instead, they want to take a stone to Germany and bury it, like Europe is burying the knowledge of us as refugees”.Nonetheless, the festival’s proponents argued that its political content helped open debates, and minds, in what they presented as a socially and artistically conventional country. “I saw many things from different voices that I have not seen before in the existing conservative art scene,” said Angelo Plessas, a Greek artist who took part in Documenta 14. 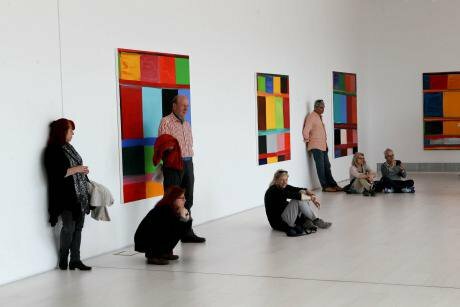 He told me: “We need to see new brave methodologies and open new discussions... We are fed up with the existing art world energy that is repetitive, self-serving and speculative. Greece is very conservative country even in its so called "radicality". There is so much nationalism and individualism in some of the criticisms [of D14]”. Plessas also suggested: “It is utopian and even naïve to expect an art festival will represent everybody or act as a charity festival”. He said: “I would have loved to have seen these activists first: to have the freedom or even courage to show their faces too in a deeper conversation and I would make a proposal to the group to think to return the stone as a symbolic goodwill gesture". Such a proposal reflects the wider disconnect of the arts world from the precarious lives of struggling and marginalised communities. It may be unrealistic or unfair to demand radical engagement from individuals and institutions whose primary goals are cultural. But it may be equally naïve for these artists to expect to be taken seriously or considered relevant by all. Hundreds of thousands of people exist invisibly on the margins of Greek and European society – not in stone or artwork, but in flesh and bone. At the very least, it seems important that arts producers acknowledge that they will forever be surrounded by experiences that outdo, transcend or undermine their own authoritative claims to cosmopolitanism and worldliness – whether or not they choose to learn from them.